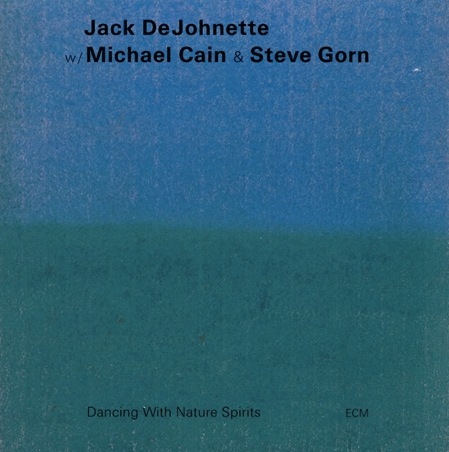 It’s astonishing to think—given the intensity of his collaboration with Keith Jarrett, Gary Peacock, and others for whom his talents were in demand as he rode a wave of worldwide prominence in the 1990s—that drummer Jack DeJohnette still found the time on shore to free such thoughtful beauty as that on Dancing With Nature Spirits. Pianist Michael Cain, in his ECM debut, makes noteworthy contributions to a deeply felt studio session, given three dimensions by Steve Gorn, here playing a variety of winds. The latter’s bansuri flute and kestrel soprano finger-paint rich undercoats to Cain’s sparkling pianism in the title track, all the while playing off tender bubbling from toms and cymbals. This low-grade fever pales into the mournful incantations of “Anatolia.” So the desert lures us, moths to candle, smudging us into the ashen backdrop. Breath becomes virtue incarnate, a doll Gorn fashions from dried reeds and lullabies. Tracings from piano and tabla push from the earth like kangaroos in slow motion, hovering above the ground for a split second before the lights are cut. “Healing Song For Mother Earth” stamps those feet back down, like hands to drum, from a wellspring of light. In those delicate freefalls we feel the vestiges of time wafting through us with all the comfort of a breeze through mosquito netting. DeJohnette scours the villages for cloth with which to dry the tears of elders who’ve relinquished hope, reaching blood-worthy sacrament in “Emanations.” The secrets of this garden stream are to be found in the waterfall that bore it unto the land like a vein in a field of muscle, where only “Time Warps” touch those reflections with silver in ecstatic storytelling. A profound album to be savored for its simplicity, heart, and message.